There are five types of non-selective and selective debridement methods, but many factors determine what method will be most effective for your patient.1 Determining the debridement method is based not only on the wound presentation and evaluation, but also on the patient's history and physical examination. Looking at the "whole patient, not only the hole in the patient," is a valuable quote to live by as a wound care clinician. Ask yourself or your patient these few questions: Has the patient had a previous chronic wound history? Is your patient compliant with the plan of care? Who will be performing the dressing changes? Are there economic factors that affect the treatment plan? Take the answers to these questions into consideration when deciding on debridement methods. BEAMS is an mnemonic that is widely used to remember the five types of wound debridement. 2. Enzymatic debridement is performed by the application of a prescribed topical agent that chemically liquefies necrotic tissues with enzymes. These enzymes dissolve and engulf devitalized tissue within the wound matrix. Antimicrobial agents used in conjunction with collagenase can decrease the effectiveness of enzymatic debridement. This method can be used in conjunction with surgical and sharp debridement. This method can be expensive depending on the insurance payer source; however, discount programs are available. Enzymatic debridement is commonly used in the long-term care setting because there is less pain and nurses can apply it daily. 3. Autolytic debridement is the slowest method, and it is most commonly used in the long-term care setting. There is no pain with this method. This method uses the body's own enzymes and moisture beneath a dressing, and non-viable tissue becomes liquefied. Maintaining a balance in moisture is important. Dressing frequency and absorbency. Dressing types commonly used are hydrocolloids, hydrogels, and transparent films (semi-occlusive and occlusive). How much do you know about debridement and chronic wounds? Take our 10-question quiz to find out! Click here. 4. Mechanical debridement is by irrigation, hydrotherapy, wet-to-dry dressings, and an abraded technique. This technique is cost-effective, can damage healthy tissue, and is usually painful. Wet-to-dry dressings are frowned on in the long-term care setting by state surveyors because of the options available with advanced wound care dressings. This type of dressing is used to remove drainage and dead tissue from wounds. A wet-to-moist dressing is another option accepted in long-term care. This type of dressing is used to promote moist wound healing and is used to remove drainage and dead tissue from wounds. Deep wounds with undermining and tunneling need to be packed loosely. Without packing, the space may close off to form a pocket and not heal leading to infection or abscess. This type of dressing is to be changed daily, compared with the wet-to-dry dressing, which is changed every 4 to 6 hours. 5. 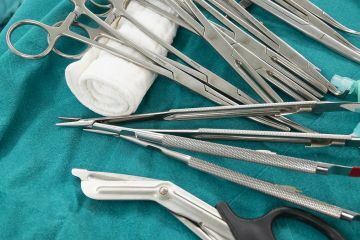 Surgical sharp and conservative sharp debridement is performed by a skilled practitioner using surgical instruments such as scalpel, curette, scissors, rongeur, and forceps. This debridement type promotes wound healing by removing biofilm and devitalized tissue. The level of debridement is determined by the level of devitalized tissue removal. Surgical debridement is the most aggressive type of debridement and is performed in a surgical operating room. Sharp and conservative debridement can be performed in a clinic or at the bedside with sterile instruments. To promote healing, reduce risks of infection, and improve patients' outcomes, and an array of debridement methods should be included in the patient's wound management plan of care. Utilizing more than one debridement method will provide consistency in wound bed preparation toward healing. As a wound advances through the cascade of healing, the transition to wound closure is not always smooth. The complexity of a chronic wound can be frustrating, but we as clinicians must utilize all methods of advanced wound care to reach healing outcomes. 1. Leaper D. Sharp technique for wound debridement. World Wide Wounds. 2002. Available at: http://www.worldwidewounds.com/2002/december/Leaper/Sharp-Debridement.html. Accessed April 15, 2018. 2. Sherman RA. A new dressing design for use with maggot therapy. Plast Reconstr Surg. 1997;100(2):451–6.